Up until this past year February 28th meant nothing more than the end of the month. In early October 2010 when my daughter was diagnosed with Congenital Disorders of Glycosylation (CDG) that changed. 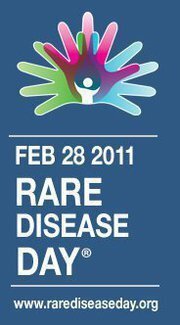 February 28th marks Rare Disease Day. A day to bring awareness to all rare diseases around the world. Many brought awareness to Rare Disease Day by keeping their headlights on all day while driving to “Shine The Light on a Rare Disease”, The Global Genes Project initiated a wear your jeans to work day to support Rare Disease Day, several U.S. States issued proclamations for Rare Disease Day, and many families shared videos of their children and loved ones to show the importance of raising awareness for rare diseases. I was recently sent an article about an amazing man – his name is Simon Ibell. Simon has a rare metabolic disorder known as Hunter Syndrome. Simon had recently biked 500km in 10 days and raised an incredible $250,000.00 for Hunter Syndrome. Not only is he a true inspiration he is also Canadian. As the mother of a little girl with a rare disorder the following excerpt from an article at Healthzone.ca titled Health-care crusader battles to ‘fix the broken system’, really resonated with me. It explains how behind Canada is in recognizing and treating rare diseases. “Despite affecting one out of every 12 Canadians, rare diseases get little attention and funding. Durhane Wong-Rieger, president of the Canadian Organization for Rare Disorders, says Canada is 25 years behind Europe and 16 years behind the U.S. in how it handles rare diseases. “We don’t even have an official definition of rare disease,” she says. The United States National Institutes of Health define a rare disease as a condition that affects fewer than 200,000 individuals in the U.S. I encourage everyone to take the time to read this article, it really was eye-opening for me on so many levels. So here’s hoping that come next February when you’re thinking about whether or not March will be in like a lion and out like a lamb, or that it’s nearly tax time – you will take a moment to remember that the very last day of the month (February 28th) is Rare Disease Day. I had no idea this day existed either. Thanks for sharing!